Today’s greatest professional challenge is keeping up to date. 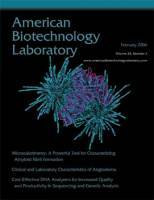 A subscription to American Biotechnology Laboratory (ABL) will help keep you abreast of the latest developments in life science instrumentation and apparatus, bioanalytical chemistry, kits, and biologicals. Progress in the life sciences and life science research is proceeding at a truly amazing rate, due in part to advances in the laboratory products that have been developed specifically for the needs of the life scientist. The editorial of Genomic/Proteomic Technology covers the new technology that will advance drug discovery, pharmacogenomics, and molecular diagnostics in the postgenomic era. The technologies applied in proteomic/genomic research covered in this supplement include mass spectrometry, separation science, spectroscopy, nuclear magnetic resonance, laboratory robotics, automated liquid handling, high-throughput screening, new biological reagents, and advanced imaging. Bimonthly columns focus on biotechnology business and regulatory matters.